Only you and your teammates can stem the tide of disease in Pandemic. When non-gamers first hear that I like to play board games, I think one of the first scenes they imagine in their minds is the one with a group of young siblings playing a competitive game of monopoly or sorry until they get in a fight and quit angrily. And while some relish the conflict and competition inherent in most board games, there is a genre of game which pits players not against each other, but against the game itself. Fortunately, if you’ve run into trouble explaining the concept, or are unsure what it means yourself, this guide is here to help you out. So, what is a Cooperative game? A cooperative game is, simply put, a game in which all of the players are working together to achieve a certain goal. The opponent, in this case, is the board game itself, which usually has a built in system to automatically hurt the players or push them farther away from that goal. The key thing to remember here is that players are not individually seeking to accomplish that goal; they are a team, and they win or lose together. The differences may seem obvious, but a Cooperative game is NOT the same thing as a Team game, which pits two or more teams of players against each other. This is also different than the “Traitor” mechanism, in which the game starts out with all players working together on the surface, but in which one or more players are secretly on the opposite team. The biggest draw to cooperative games is that you generally finish the game with no hard feelings against your opponents. Unless you already have some personal issues between the other players, your actions in game will not hurt each other. You will win and lose together, which means you will celebrate victories and mourn the losses together, and no one feels left out. 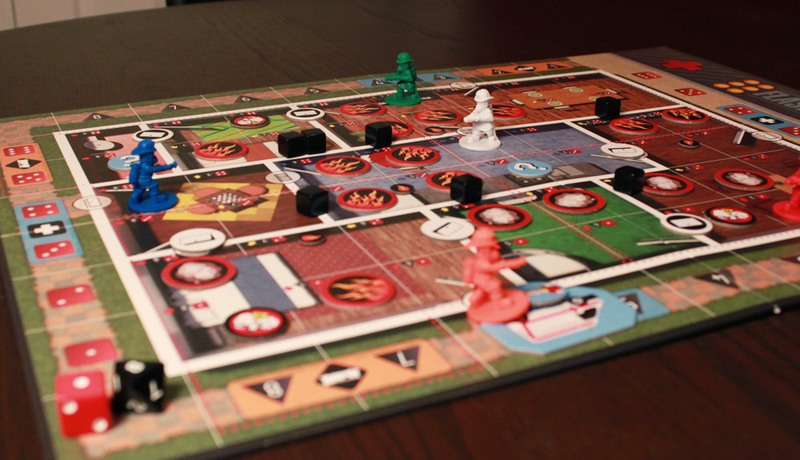 Teamwork is key in order to rescue victims and keep the house from burning down in Flash Point: Fire Rescue. Cooperative games tend to be highly interactive. Not necessarily because players can interact on the game board, but because success requires working together, planning actions ahead of time, and thus communication. Players can be involved even when they are not directly taking action, as they can offer suggestions, point out optimal moves, and report their own plans for what they can accomplish on their own turn. Cooperative games also tend to be more friendly to younger players. This isn’t always true, but the nature of the cooperation allows older players to help out their younger allies, while still allowing them to play “on their own.” This makes certain games more appealing to both young kids and adults, allowing enough complexity to remain interesting but allowing the kids to participate. In a competitive game, adults often must “play down” to their younger kids to allow them to have fun, which usually isn’t as fun for the adult (besides the fun of playing with kids, which is fun, but that’s outside of the game itself). In order to be the most enjoyable, a cooperative game must present a challenge. Most cooperative games incorporate a level of randomness to make the solution to each game unique, rather than presenting a puzzle that can be “solved” the same way each time. 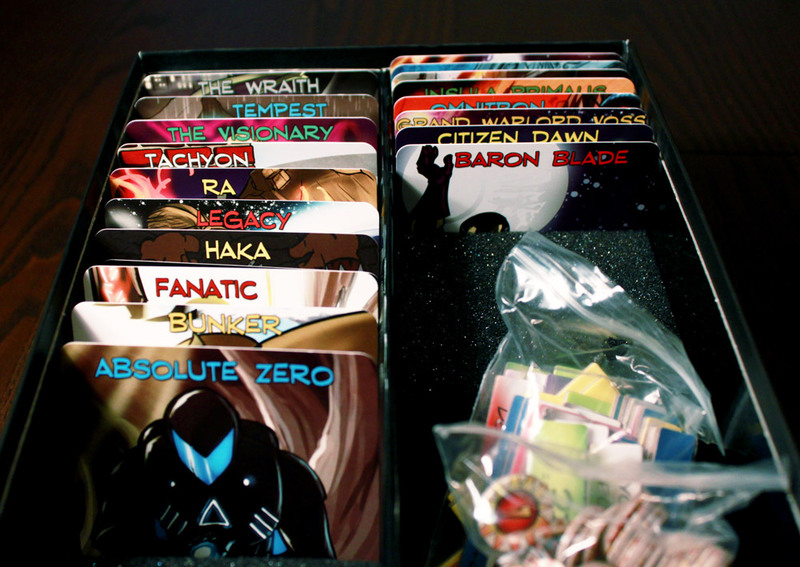 A variety of heroes and villains keeps things interesting in Sentinels of the Multiverse. A common mechanism used is the spread of some sort of “badness” across the board, which the players must contain. In Pandemic, disease cubes spread across the globe. In Flash Point, Fire explodes through the house, and in Defenders of the Realm, monsters invade the country side. Cooperative games require some automated process to counter the players, so that no player has to control the opposing team, which would, of course, make it a team game, not a cooperative game. A common turn sequence would allow a player to take some good actions, and then draw a card which instructs the players on how the trouble advances. Other cooperative games use a real-time system, usually driven by an audio CD or mp3 track that gives instructions or acts as a timer. For example, in Space Alert players must plan their actions over the course of a 10 minute audio track, which reports incoming trouble such as asteroids, alien attackers, and other sorts of encounters, drawn from a randomized deck of cards. Players must plan all of their actions over the course of about 12 steps, and when the audio track finishes, players resolve the scenario according to the opponents placed and their planned actions. You didn’t see how frantic the dice were rolled to get these two people here. Escape uses a similar, though much simpler system with a 10 minute audio track. Players are rolling dice in attempt to explore an ancient temple and find the escape before time runs out, but every 3 minutes or so, a gong on the audio track alerts the players that they must rush back to the center of the temple or lose one of their dice. This creates a frantic system of rolling dice constantly. Most cooperative games have some sort of timer. Escape and Space Alert have a literal timer, but games such as Pandemic are timed by the limited number of cards in the player deck. Red November, a game in which players take on the roles of dwarves trying to keep their heavily damaged submarine afloat and in one piece until help arrives, has a time track. Each action the players take uses up a certain number of spaces on the time track, and the game ends badly if they run out of time. Legends of Andor has the Legend track, which moves every round as well as when players perform certain actions, and Police Precinct has a simple turn tracker. Often, there are many ways to lose a cooperative game and only one specific goal needed to win. The best cooperative games force players to balance dealing with immediate problems that threaten to overwhelm them with accomplishing the long term goal of the game. 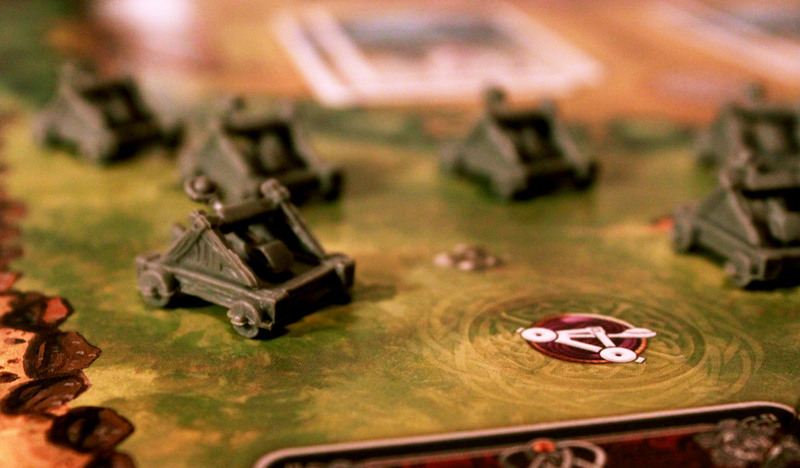 Invading catapults are just one problem to deal with in Shadows over Camelot. Complaints leveled against cooperative games usually involve the idea that they are too easy, since the game has no intelligence and is simply doing random things. Some also complain that cooperative games usually result in one player simply telling everyone else what to do rather than allowing all players to have input. 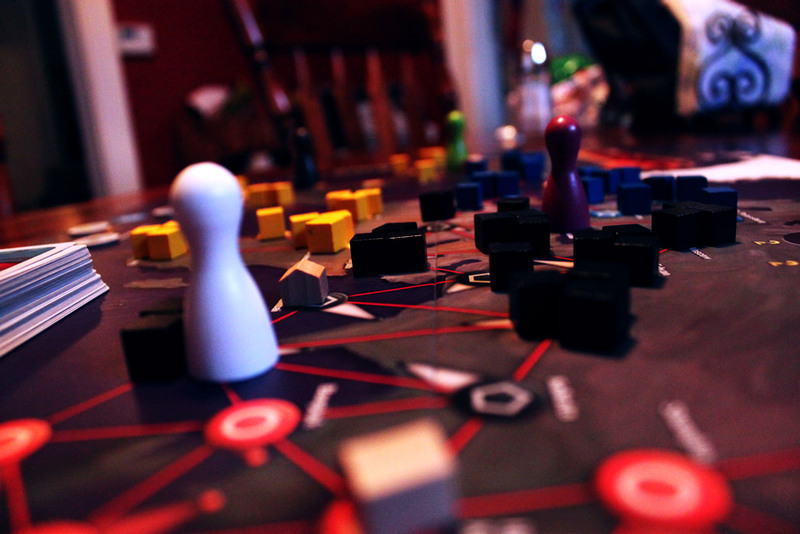 Many cooperative games have a longer setup time as well. We’ll probably have a separate article on Traitor games, but many cooperative games have a “Traitor” option, which is added in to create more challenge or to make the game more interesting. Shadows over Camelot is a cooperative game designed to be played with the Traitor, although players will want to play cooperatively a few times to have any chance of balance between the two sides. Police Precinct has a “Dirty Cop” option. Even Pandemic has a “Bio-terrorist” option in the On the Brink expansion, although the identity of the traitor is not secret, just their location. Pandemic: Probably the best cooperative game out there, Pandemic is challenging and fun. Though probably too complex for younger kids, it is still a great family game, and once you’ve mastered the original box you can add the On the Brink expansion, which adds fun new roles, special event cards, and challenge options. Flash Point: A delightfully fun game about fighting fire and rescuing victims, which is quick to learn and fun to play and replay. Forbidden Island: A simplified version of Pandemic that is great for families with kids, and is interesting enough for adults to have fun too. It also features an exciting and tension-building “sinking island” mechanism in which the island slowly disappears over the course of the game, leaving you with less and less room to move. Space Alert: A frantic and hilarious real-time game in which you must plan all your actions simultaneously before seeing how everything pans out. Usually terrible things happen to everybody and nothing goes right, but it is quite funny to watch the horror unfold. 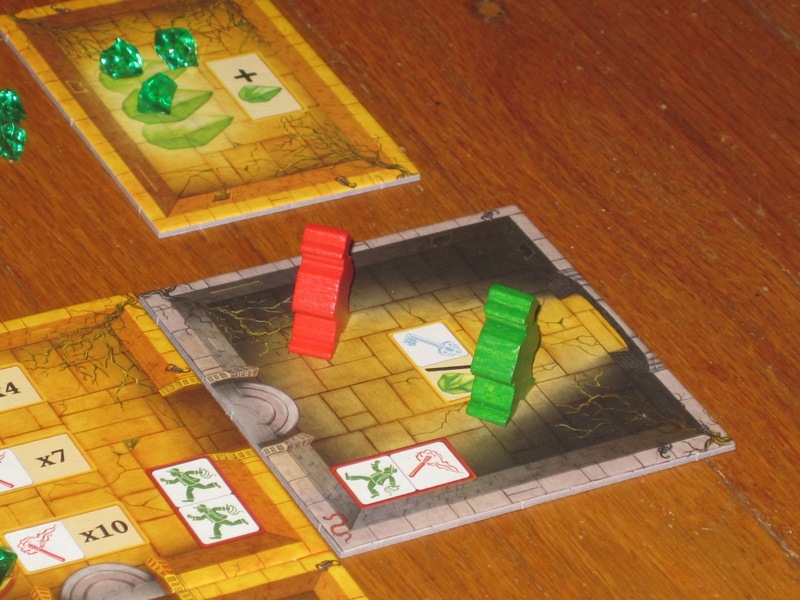 Escape: Curse of the Temple: Another frantic real-time game but much simpler than Space Alert, players are tasked with rolling dice and using what is rolled to explore the temple, move around, and unlock gems to ultimately escape. Sentinels of the Multiverse: A highly thematic cooperative card game featuring superheroes and super villains in an epic battle royale. Large numbers of heroes to choose from and a selection of villains and environments keep the game fresh and exciting. 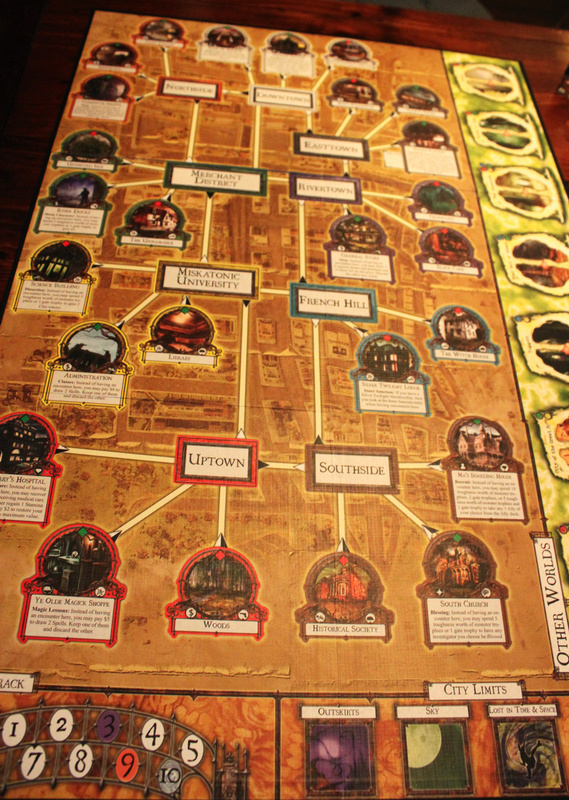 Arkham Horror: A long-winded and difficult excursion into the world of Arkham, Massachussetts, as created by H.P. Lovecraft. Cthulhu fans win enjoy this foray into a world of mystery, horror, and insanity, if they can stomach the 5+ hour playtime. Elder Sign: Set in the Arkham Horror world with the same characters and familiar monsters, Elder Sign packs it down into a 1, 1.5hr experience with lots of dice rolling. It’s a very deadly place to be, in Arkham Horror! Any great cooperative games that I missed? Any other thoughts to add about Cooperative games? Let us know in the comments! Flying Frog has a few games of note, my wife enjoys them, “A Touch of Evil” is a thematic experience similar to the Sleepy Hollow movie with several classic monsters and set of minions for each, “Fotune and Glory” is tomb raiding and fighting Nazi’s. We can’t comment on their other games but “Conquest of the Planet Earth” is co-op (all these games have competative and team versions along with advanced and basic rules, Conquest was too easy on basic the one time I played it). And from 8th Summit “Agents of Smersh” is a good co-op with strong story elements. I didn’t think Fortune and Glory or a Touch of Evil were cooperative games, but I guess you learn something new every day! I was going to say that the 2005 Arkham Horror was a re-release and while it was way more successful than the original, shouldn’t the original get included because it was the first co-op game. Then it occured to me that I wasn’t sure if that was actualy the case (It’s just something I hear a lot) and went digging for the world’s first co-op game (defined as one that the players do not win or lose as individuals) and the results are kind of perculiar. I think it’s either the Ten Commandments Bible Game (1960) SimSoc (1966) Democracy (1966) or the Captain Scarlet Game (1967) based on how far you’re willing to stretch the definition of “game”, which strikes me as kind of an odd set (one of them is more of a social sciences teaching tool). Unless I’m missing the joke, there’s a typo in the section header “Tecommended Cooperative Games”. Feel free to delete this comment, unless it’s to explain the joke I’m missing, as it doesn’t contribute to the discussion.